The article claimed that the burial was delayed for three months due to financial wrangling between Janet Jackson and the Michael Jackson Estate. This claim is baseless and totally false. This, however, didn’t mean that Mr. Jackson would indeed be laid to rest at Forest Lawn. The contract was just to secure a spot. As evidenced by the invaultment arrangement, the Jackson Family was still considering alternatives as the final resting place for the Gloved One. The reason that the burial was delayed for 3 months was the dissent among the Jackson Family members over a proper burial place. Neverland, Forest Lawn, Las Vegas and Garry, Indiana were among the Family's considerations. 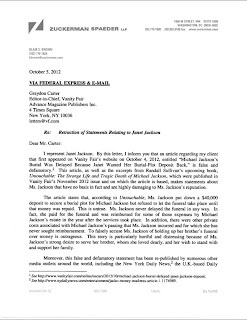 Janet's reimbursement was never an issue in Michael Jackson’s burial as Randall Sullivan claims. In fact, payment was no issue at all on any front. Randy Jackson, on behalf of the Jacksons Family, didn’t even approach the Estate for payment till August 29, 2009. This is the very date when the Jacksons learnt that neither the Forest Lawn nor the Glendale Police Department will proceed rendering their services without full payment. Michael Jackson Estate was fully supportive of Michael Jackson getting a befitting send-off but because the Estate was under probate and such decision needed the approval of the probate judge, the Estate couldn’t just write a check. On Saturday August 29, 2009, The Estate advised Katherine’s attorney Burt Levitch to seek an immediate ex parte asking the judge to authorize the Estate to make the payment. The Special Administrators and their counsel were contacted by Michael Kane, who was contacted by Randy Jackson who was seeking the guarantee of the Special Administrators that the funeral bills and related security costs would be paid out of the Estate. As you know, the decisions regarding Michael Jackson's funeral are entirely those of Katherine Jackson, and the Special Administrators have no role in it. However, it appears that Mrs. Jackson and Randy Jackson may be under the erroneous impression that the Special Administrators can advance funds or guarantee reimbursement of costs for the funeral. Of course, the Special Administrators can do neither. You may wish to consider seeking immediate ex parte approval of the court for payment of the expenses in advance of the final arrangements. The Special Administrators will waive the customary 24 hours notice if you choose to move on this matter on Monday morning. The Special Administrators are certainly supportive of the Mrs. Jackson's desire to have a funeral commensurate with Michael Jackson's status as perhaps the greatest entertainer who ever lived. However, on this matter, we must turn to you to represent your clients before the court, and trust that you will have your clients understand that the amount that the court will authorize for reimbursement is entirely in the hands of Judge Beckloff. 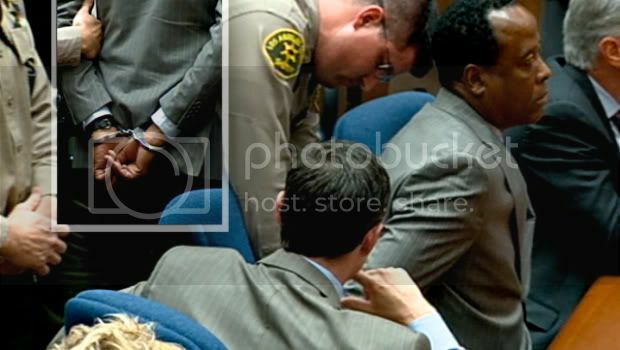 Please be advised that, on behalf of Katherine Esther Jackson, I plan to appear ex parte in Room 258, Los Angeles Superior Court, 111 North Hill Street, Los Angeles, California 90012, at 8:30 a.m. on Tuesday, September 1, 2009, to seek an order for immediate payment from the Estate of the decedent's funeral expenses. Should you have questions prior to the appearance, please let me know. "Mrs. Jackson seeks an order granting the Special Administrators the authority to make immediate payment for the funeral expenses. Prompt action is necessary to facilitate the burial of the Decedent as scheduled on September 3, 2009. Forest Lawn requires payment in full before it will file for the requisite burial permit which needs to be issued in advance of the planned burial. Only as recently as August 29, 2009 did Mrs. Jackson learn that both Forest Lawn and Glendale Police Department will not provide their services without receiving payment prior to rendering those services. Judge Mitchell Beckloff swiftly approved all the funeral expenses asked by Katherine Jackson which is approximately $1 million. The funeral expenses were paid before the burial on Sep 3, 2009. The Estate reimbursed Janet in 2010. At no point did the Estate or Janet Jackson make an issue of payment for the funeral expenses. Randall Sullivan’s claim that Janet Jackson or the Estate delayed Michael Jackson’s burial is absolutely false. a retraction of the false story on its website and in its November issue. I represent Janet Jackson. 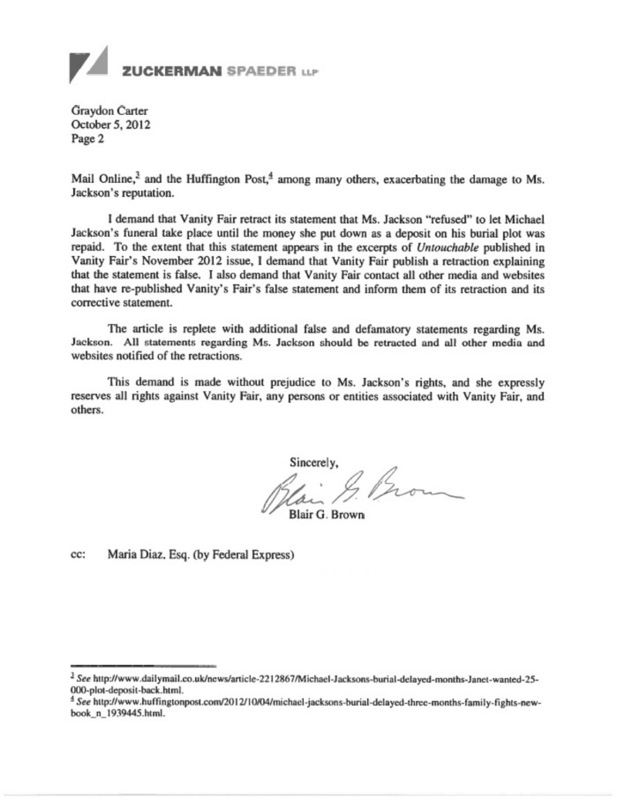 By this letter, I inform you that an article regarding my client that first appeared on Vanity Fair’s website on October 4, 2012 entitled “Michael Jackson’s Burial Was Delayed Because Janet Wanted Her Burial-Plot Deposit Back” is false and defamatory. 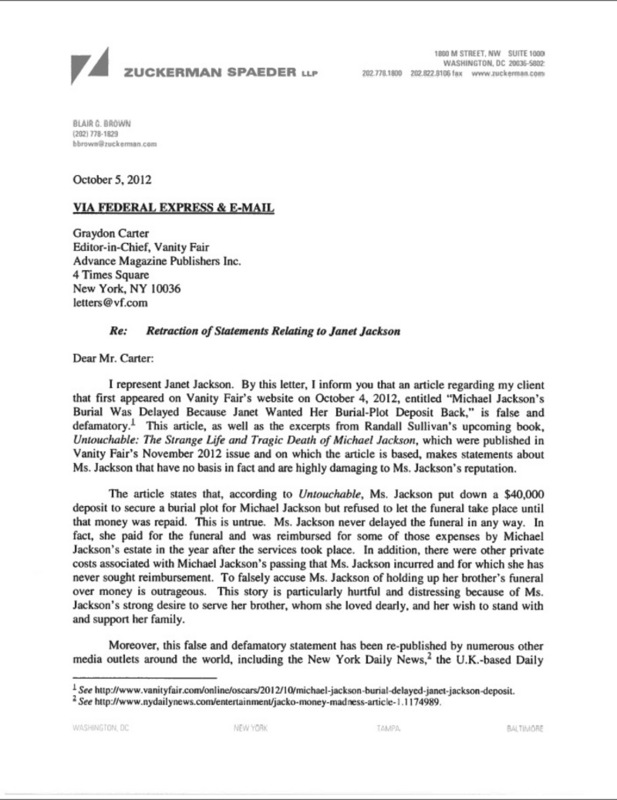 This article, as well as the excepts from Randall Sullivan’s upcoming book, Untouchable: The Strange Life and Tragic Death of Michael Jackson, which were published in Vanity Fair’s November 2012 issue makes statements about Ms. Jackson that have no basis in fact and are highly damaging to Ms. Jackson’s reputation. The article states that, according to Untouchable, Ms Jackson put down a $40,000 deposit to secure a burial plot for Michael Jackson but refused to let the funeral take place until that money was repaid. This is untrue. Ms. Jackson never delayed the funeral in any way. In fact, she paid for the funeral and was reimbursed for some of those expenses by Michael Jackson’s estate in the year after the services took place. In addition, there were other private costs associated with Michael Jackson’s passing that Ms. Jackson incurred and for which she has never sought reimbursement. To false accuse Ms. Jackson of holding up her brother’s funeral over money is outrageous. This story is particularly hurtful and distressing because of Ms. Jackson’s strong desire to serve her brother, whom she loved dearly, and her wish to stand with and support her family. Moreover, this false and defamatory statement has been published by numerous other media outlets around the world including the New York Daily News and the UK-based Daily Mail Online and Huffington Post, among many others, exacerbating the damage to Ms. Jackson’s reputation. I demand that Vanity Fair retract its statement that Ms. Jackson “refused” to let Michael Jackson’s funeral to take place until the money she put down as a deposit on his burial plot was repaid. To the extend that this statement appears in the excerpts of Untouchable published in Vanity Fair’s November 2012 issue, I demand that Vanity Fair publish a retraction explaining that the statement is false. I also demand that Vanity Fair contact all other media and websites that have re-published Vanity Fair’s false statement and inform them of its retraction and its corrective statement. I never believed one second this lie about Janet and I found it really freaking funny that she's been bashed constantly whereas she is the one who always had MJ's back an ever betrayed him and his two scums back stabbing money hungry siblings Jerms and Latrash are praised,exploiting his death and his kids!What the hell is wrong with the world? ?